Today I ate well and had a lovely long walk so I am feeling great this evening. I slept well last night and woke up feeling more energised than I have recently so I decided to tackle the chaotic jumble of papers and piles of I had forgotten what, in to some semblance of order. So engrossed was I in my task that I failed to notice the clock tick by and it was lunch time before I had even had breakfast. Fancy me missing a meal! I dug out a book I have had for a few years for inspiration for a salad for lunch and chose a recipe called ‘Seductively Squishy Salad’. 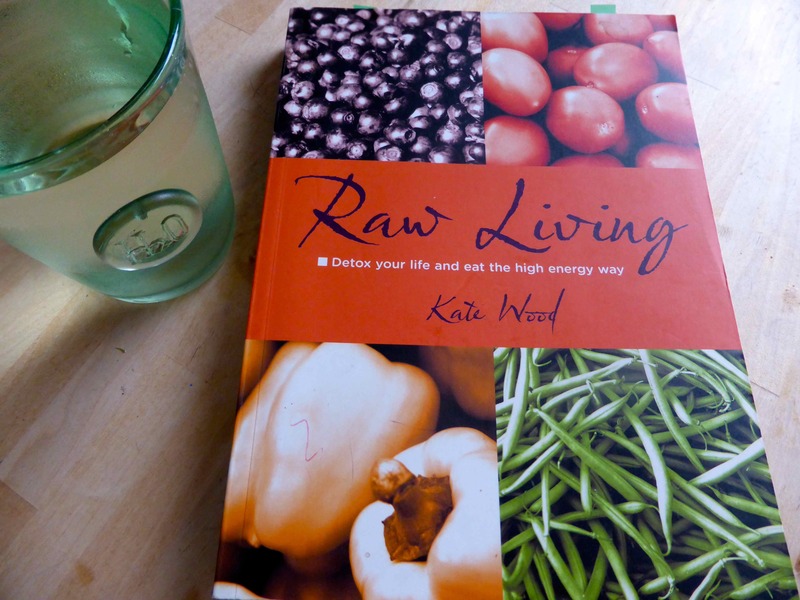 I assembled a similar list of ingredients as those in the book: half a romaine lettuce, a huge pile of rocket, some coriander, half a cucumber, a red pepper, 2 carrots, the juice of a lemon, 1 tsp of hemp protein and sea greens and an avocado. I was feeling hungry so I ate 2 brazil nuts while I washed and chopped the veggies. Following the instructions I piled everything in to a large bowl. Then stuck my hands in and squished the avocado through the veggies. It initially looked a bit of a mess. But when it was piled up on the plate it looked better and it tasted great. I will be making a squished salad again. 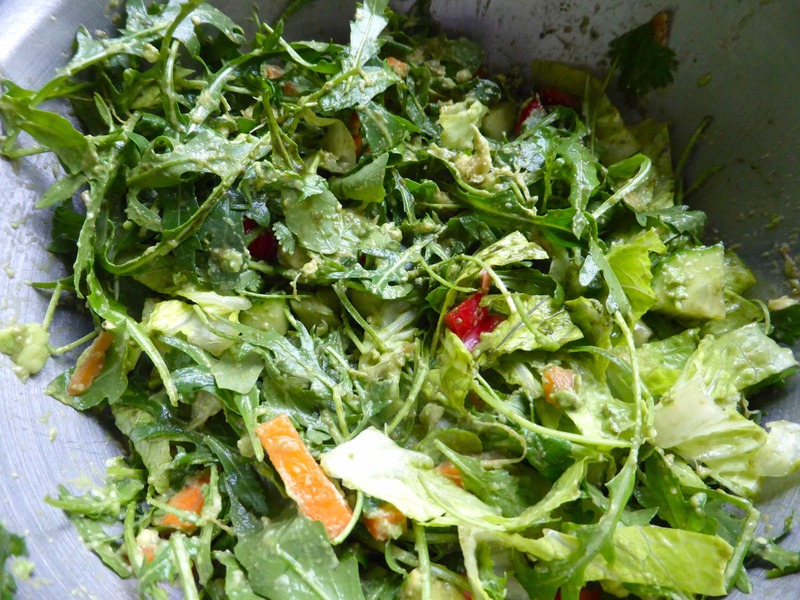 When you have the leaves coated in avocado, there is no need to add another dressing. I am trying to encourage Harvey to eat more plant foods in general and salad in particular. He is really good at eating fruit and cooked veggies but quite reluctant with salad unless it is covered in a creamy dressing and topped with croutons. 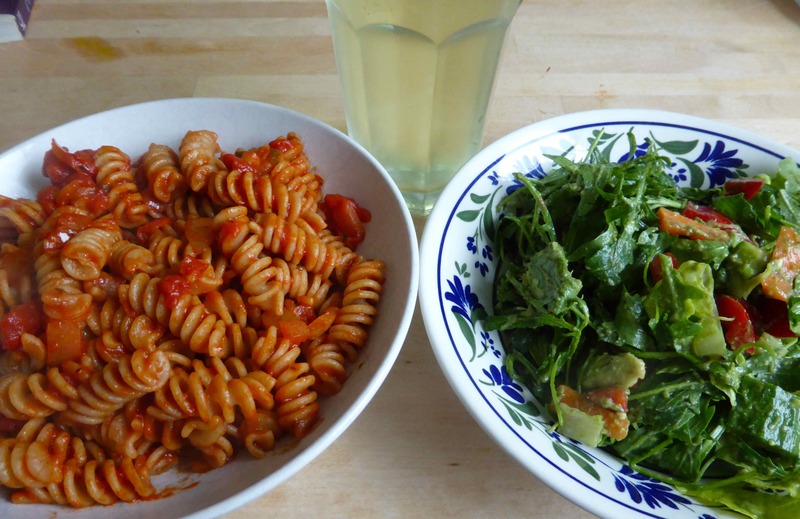 I want him to learn to like the natural flavours of the raw plants so he was asked to eat a salad with his pasta. He declared it to be “disgusting” but managed to eat about half of it. I am grateful for any consumption of salads so was pleased with that. I was really pleased by how much he is enjoying the cucumber and lemon water which he is swigging back. 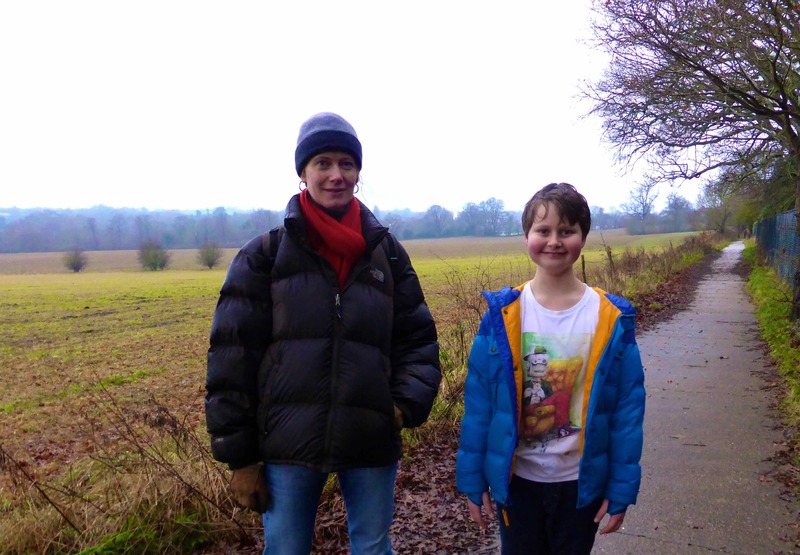 At 2pm we braved the gloomy weather and went out with Annette who showed us a lovely walk from our village to Cranbrook. 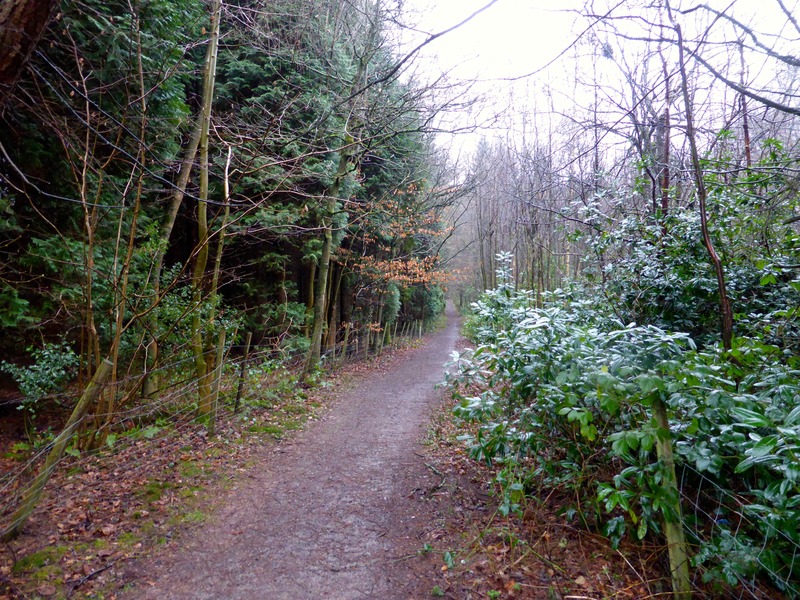 I have lived here for 13 years and never known about this walk even though I have driven near these footpaths for all these years. 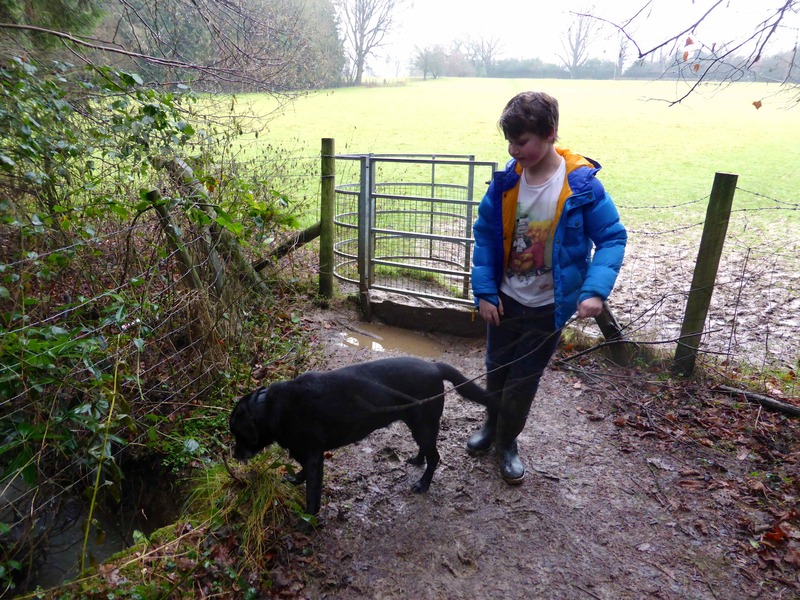 I think Harvey enjoyed being with Ebony rather than admiring the pretty route. Thank you Annette for encouraging me out on another walk and for showing us this charming network of footpaths we can use to walk to town. We shall do it again when hopefully we have better weather as there was a lovely view along this part of the walk. Supper was a quick and easy stir fry. I heated some coconut oil and fried onions and garlic with some Thai red curry paste. 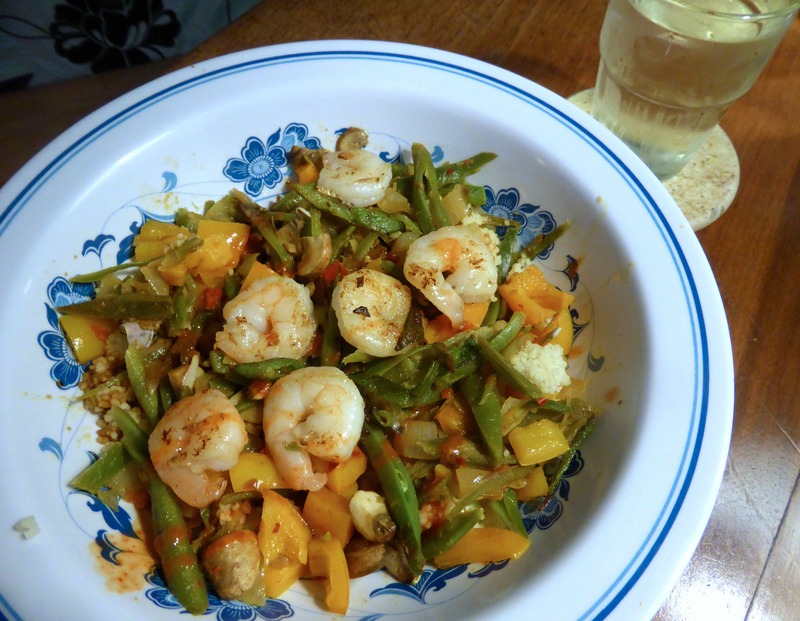 I then fried an orange and a yellow pepper, some runner beans and king prawns. 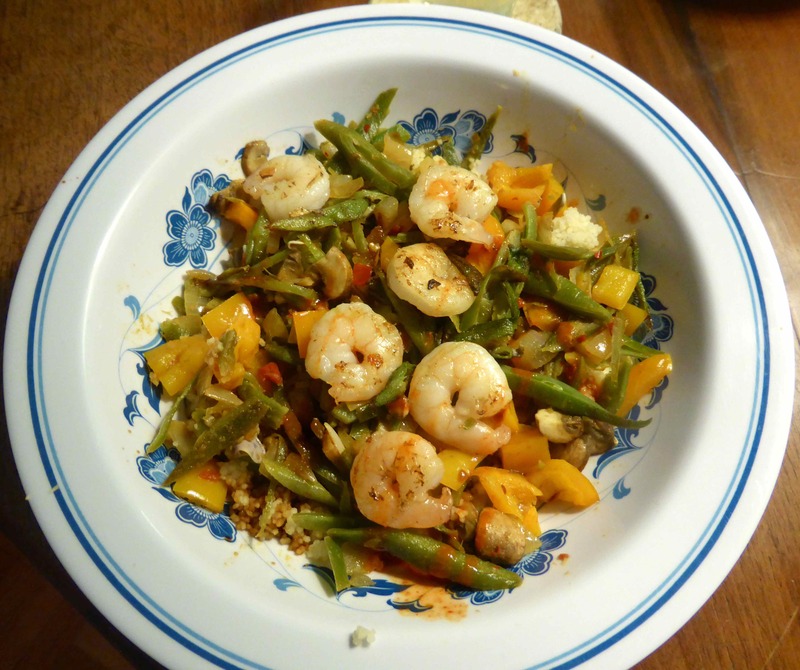 I served them on couscous (I much prefer rice but I had run out) with a dollop of Cholulah, a hot pepper sauce. It was very tasty. Apart from 2 cups of tea, and the hot lemon water with honey and apple cider, I have drunk several glasses of cucumber and lemon water throughout the day. It really is very pleasant. No complaints from the Little Fella about this meal. 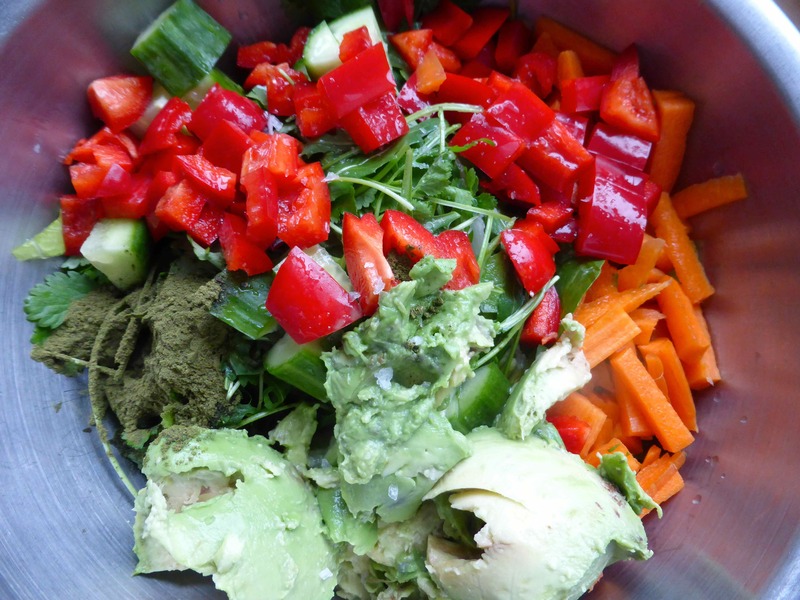 This entry was posted in Uncategorized and tagged Avocado, Salad, Stir Fry, Walking. Bookmark the permalink. I will have to try your squished salad with avocado. I have mine with plain goat cheese squished through it. 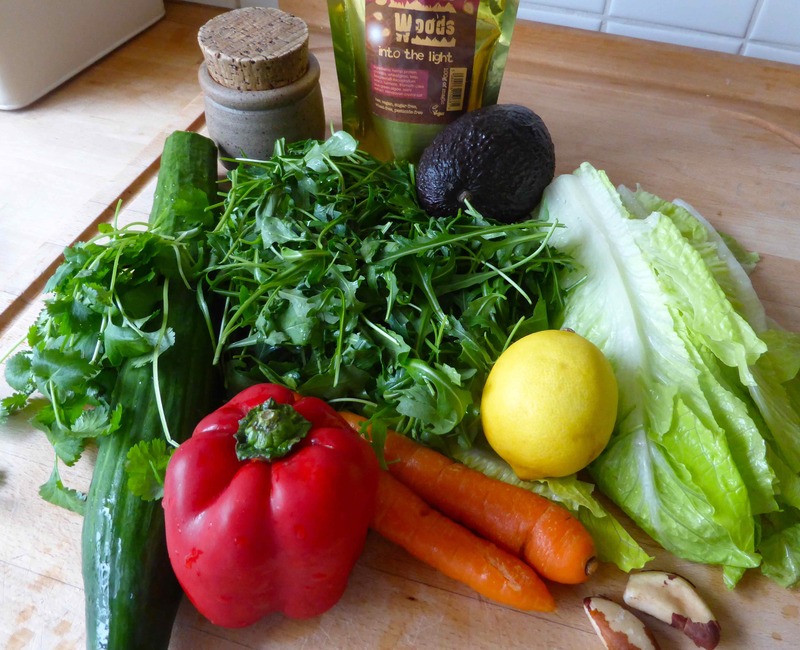 That is my salad dressing, but have to now try it with avocado. I am so glad you are feeling better with the better foods and outdoor exercise. I really am and it is a relief. 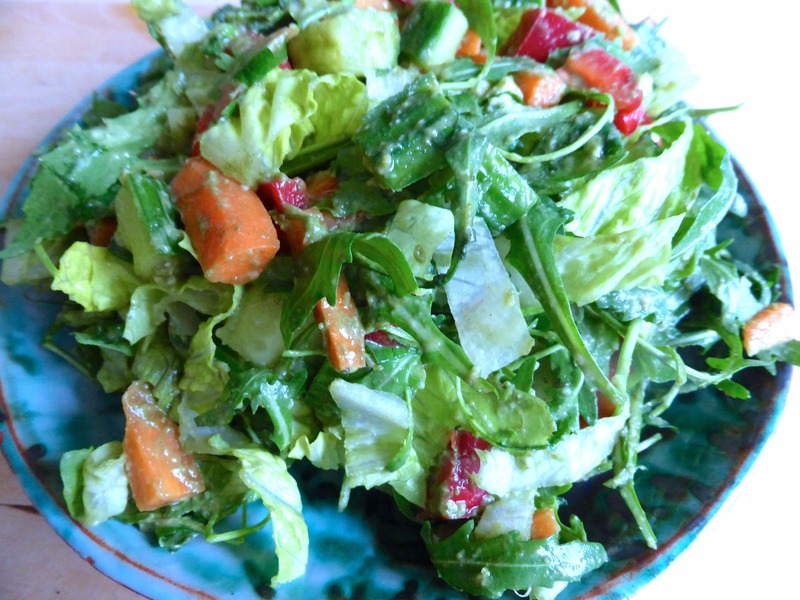 I would like a squished salad with goat’s cheese but I am trying to avoid dairy for now – I eat way too much. It is easy when I just cook for myself and Harvey because he is dairy intolerant. I recommend the avocado though, it works really well.